Roll the tape back to September 1990. The first George Bush is president; the Gulf War is simmering on a desert horizon; Bill Clinton’s presidency is two years distant and an uncertain millennium a decade away. In Chicago, Richard M. Daley is still a fresh face in the mayor’s office. Visual, verbal and dramatic arts are surging throughout the city, paced by the explosion of performance poetry, itself drawing from the energies of rock and punk music. Not coincidentally, independent coffeehouses are sprouting throughout the region such as has not occurred since the tumultuous sixties. A scrappy newsprint tabloid, 20,000 copies monthly, launches itself into this caffeinated wave along the lakeshore: Strong Coffee, a free lit-rag of the coffeehouses, by the coffeehouses and for the coffeehouses. In its severe vertical columns, fiction, poetry and creative nonfiction stand in tight type beside often-striking art and satirical cartoons. Now fast-forward just three years; a night at Lincoln Park’s pioneering internet café, Discover, across from the Biograph. Surrounding me are creative colleagues who are the caffeinated heartbeat of Strong Coffee. Three or four conversations are percolating. From this free exchange, elements of the next issue take shape. Artists open up their portfolios to us; writers read from works in progress. Performance poet Terry Jacobus shares one of his short, semi-fictive memoirs in which our regulars are assigned mythic names. In these, South Side playwright and astrologer Frank Steele Pulaski is “Starman.” For us, Pulaski writes street-smart morality tales, like “The Perfect Fit,” in which a fledgling shoe salesman forms a silent conspiracy with a domineering woman to punish her henpecked husband for his lack of simple courage. We did not know then it would be a rollicking seven-year ride. I was the editor and my friend Tom Asch was the publisher, but titles mean little when you captain an uncertain vessel instead of a liner. There would have been no Strong Coffee without a crew of regular contributors and wider circle of occasionals. The works of about 500 writers and artists would emerge in the pages of Strong Coffee. Few readers of those days would be shocked to learn that our regular contributors were energized by weekly, free-swinging open meetings of contributors gathering at local coffeehouses. These were frequently compared to the “Mad Hatter’s” tea parties. What readers might be surprised to learn, however, is that this madness creating the medium that was Strong Coffee resulted from a year’s worth of actual planning. The absolute beginning was in Evanston, where Tom and I had met and exchanged views and writings over coffee at the old Café Express at Dempster and the El stop. Tom was a Columbia University-trained lawyer who made room in his life for poetry, and I was a freelance journalist from Missouri whose University of Chicago education and connections had stranded me for two long spells in Chicago. Of course, caffeine will stir dissatisfaction as well as ideas. Once when Tom was neglected by our ruling hostess, he wrote a satirical poem “The Café Matron” inspired by Edgar Allan Poe’s “The Raven” and posted it at Express, much to the hostess’ chagrin. It occurred to us that this “there oughta be a law” impulse could be tempered—and our creative urges fulfilled—by a publication circulating through the coffeehouse community. We knew there was even a historical precedent in Restoration-era London, where broadsides and papers like the legendary Spectator emanated from coffeehouses. Chicagoans, too, were just learning that coffeehouses were crucial “third places” away from home and work. It is an irony perhaps that the apparent spontaneity of Strong Coffee resulted from a year’s worth of planning, and the name itself—seeming so natural—came fairly deep into the mutual efforts of five original partners, Tom and myself; design director Jerry Reinwaldt; editorial photographer David B. Sutton, and freelance writer and business consultant B.G. (Bob) Yovovich. From individual expectations we crystallized a list of goals for a free printed outlet for writers and artists aimed at Chicago’s coffeehouse culture, financed through advertising and—we hoped—profitable. The idea that it would be an expression of the spirit of coffeehouses was central. Yovovich stressed that it would not be a “coffeehouse journal” but rather a “coffeehouse of the mind.” We created long lists of prospective titles, ideas like “Café Resume” dismissed because they seemed too intellectual or referential and not embodying our central idea. The dictionary got a heavy workout but then Asch simply threw “Strong Coffee” into the brew. It was summarily dismissed. But as we examined each alternative, Strong Coffee kept re-emerging. Finally, we all agreed: Why not “Strong Coffee”? I proposed that we put titles first and names of their creators last, and that editorial and art be mixed democratically. It was the early days of desktop-influenced design, and we agreed that most publications were too noisy with a hodgepodge of type styles. I pointed to the extreme vertical columnar format of nineteenth-century newspapers as a model to emulate, a concept that Reinwaldt brilliantly reformulated for the 1990s into tabloid format with our logo in bold Stymie type, all folding down to a letter-size cover for counter display. Strong Coffee came to light in nearly 200 venues. Certain columns were there from the beginning: Tom’s pseudonymous “The Teachings of Baba Java: Path to Coffee Consciousness” lampooned New Age consciousness while suggesting there was no human problem you couldn’t drink through with caffeine; “The Jagged Edge” assaying the poetry scene, penned by “Aunt Louise” (actually poet Susen James, it can now be revealed); Frank Pulaski’s ribald horoscope, “Madame Sosostris’s Wicked Pack of Cards,” a guilty pleasure and quick cult favorite in which the writer pushed the envelope so hard he was occasionally woodshedded by the editor (surely it is only a coincidence that Frank regularly referred to Sagittarius—the editor’s sign—as the “scum of the zodiac”). “Spilt Milk,” was a satirical wrapup of the month’s news topped by an image of Mrs. O’Leary’s cow against a fiery skyline. Later would come searching Q&As by Effie Mihopoulos with lights of drama and dance, and reports from the hinterlands by former Chicago hands Al Simmons (West Coast) and (from Wisconsin) Norbert Blei and Tulia Lightfoot. 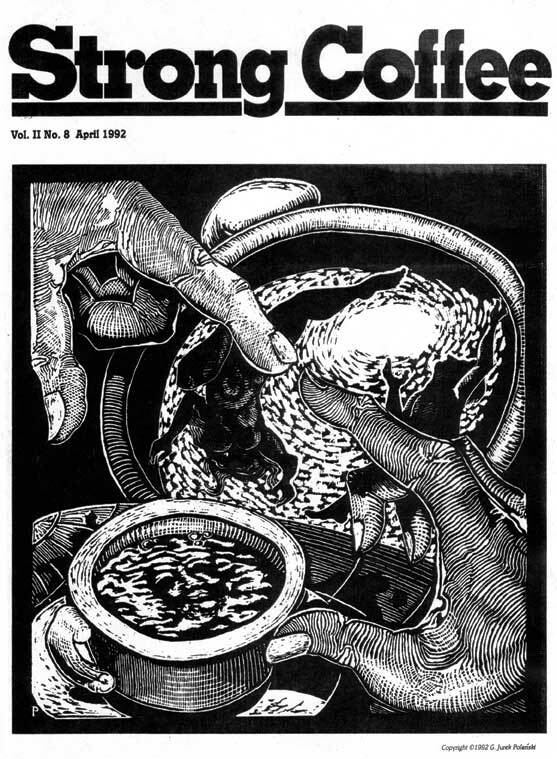 On the art side, Jurek Polanski’s comic “Coffeemugs” soon would evolve into the highly distinctive “Den and Dare,” populated by lovable café-denizen rodents and paced by merciless punning. From the beginning, there was always at least one double-column “Gallery” featuring notable art. 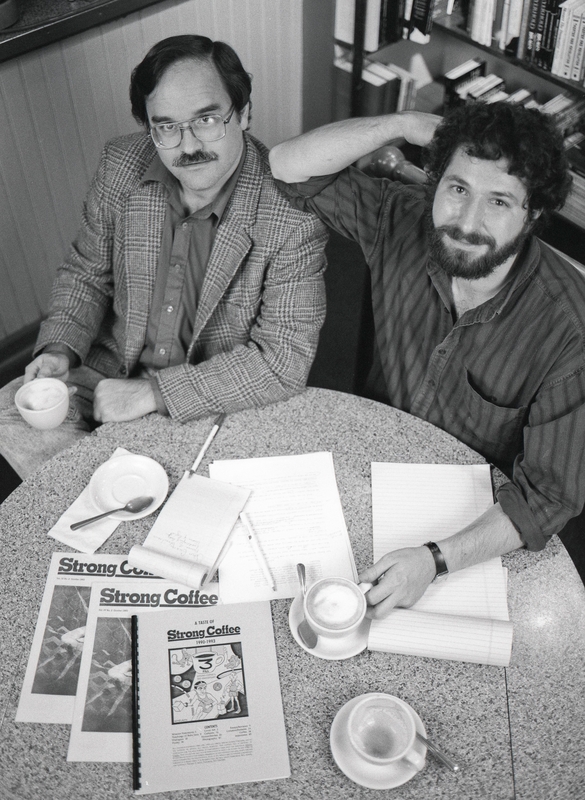 As Jurek took the helm as art editor (later joined by Randon Newnum), over the years Strong Coffee would become a magnet for both artists and cartoonists. Amy Madden and Nicole Macaluso (now Collins) were there from the get-go (Nicole still calls Jurek her artistic “big brother”). And then the cartoonists: Charise Mericle, Eric Semelroth, Matt Giddens, Jim Pera and more. Tom and I had the “last word” and “first word” respectively. Tom’s closer was always an apt poem. In my opener essay, I evoked the title of one of my favorite Robert Penn Warren novels (Chicago-set) and suggested to readers Strong Coffee might be their “place to come to” from out of the urban storms. Perhaps they would be reassured that we all would share the same leaky craft in the hands of the coffee gods. “We coulda been a contender,” Mike O’ (“open mike,” get it?) carped in “Spilt Milk” after Chicago opted out of contention for the World’s Fair, citing failures at New Orleans and Knoxville. “Knoxville?” importuned Mike. Was it even possible Chicago couldn’t make hay out of the 500th anniversary of Columbus or the 100th of Chicago’s own landmark Columbian Exposition? “Big shoulders, indeed,” he scolded. Generally, we believed that publications sponsoring theme issues produced inferior results, but here we saw a challenge. After batting the idea around in open sessions, we printed ads soliciting submissions for a special “World’s Fair” in print. “Our World’s Fair is a Great World’s Fair,” we trumpeted. Paced by a Homeric effort of our artists led by Jurek Polanski, the result was a memorable September 1992 second-anniversary issue. It featured an imaginative two-page “double-truck” map of “our” lakefront world’s fair penned by our artists (“Strong Coffee Towers” dominated the landscape; why not, after all, it was our fair!). Occasional contributor Lee Nading—a Bloomington, Indiana artist educated at the School of the Art Institute of Chicago—provided an original “Totemic History of Chicago” on the lake that led page one. 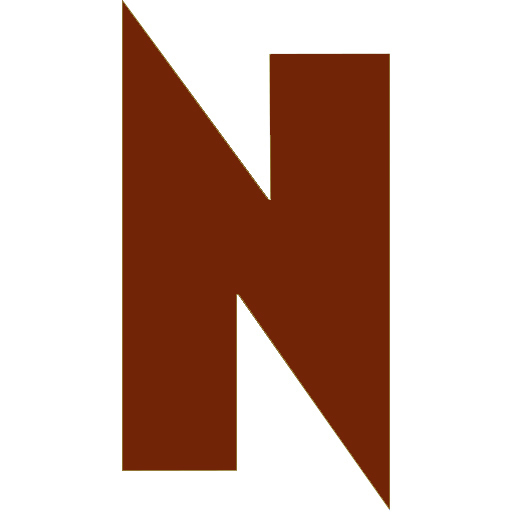 And noting the 100th anniversary of the unveiling of historian Frederick Jackson Turner’s influential “Frontier” essay for the Columbian Exposition, Strong Coffee co-founder Bob Yovovich—a business writer who is an expert on trends—saw fit to take on the historian’s thesis in an iconoclastic front-page essay. Citing the long dominance of that theme in American culture and politics, Bob proposed in light of contemporary facts, “However much one might wish otherwise we are now a Frontierless society, and we must maturely and honestly face our problems without looking for solutions that invoke old myths that are not now appropriate.” Too bad cowboy George W. Bush, then still shy of his “twelfth step,” wasn’t a Strong Coffee reader. Editorial assistants—unpaid interns, mostly college students who worked for us a year or two—were a big part of Strong Coffee’s vitality. They wrote coffeehouse news items for the monthly “Café Resume” and contributed fresh ideas and fresh work. We knew Audrey Niffenegger was a valued teacher at Columbia College, and we were delighted to see, as submissions, reproductions of her realistically rendered but wickedly sarcastic paintings. 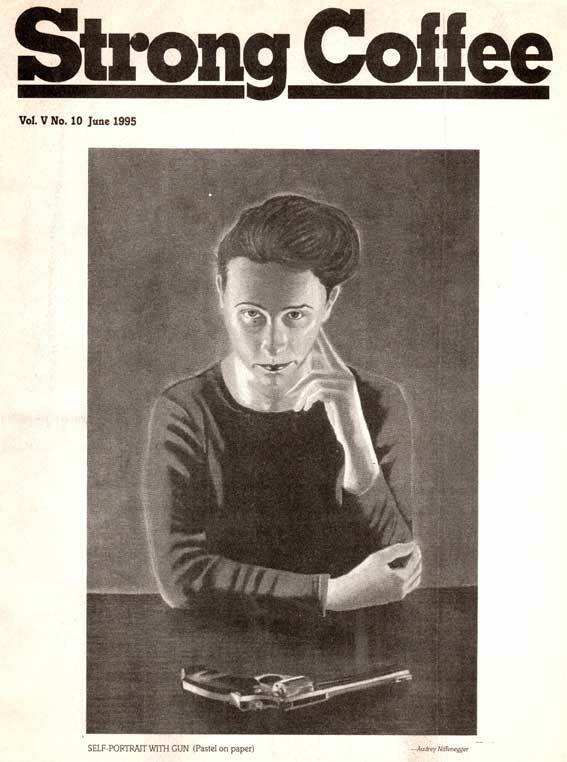 One we published as a cover was a self portrait: a revolver lies on the table in front of her; you know it is loaded, but her expression leaves no doubt that it is homicide, not suicide, on her mind. We began to refer to our “monthly miracle.” Except for contributors at the very beginning, nobody made any money from Strong Coffee, but Tom Asch and longtime business manager Lee Nagan keep dreaming up fresh ideas to keep the magazine afloat with advertising. 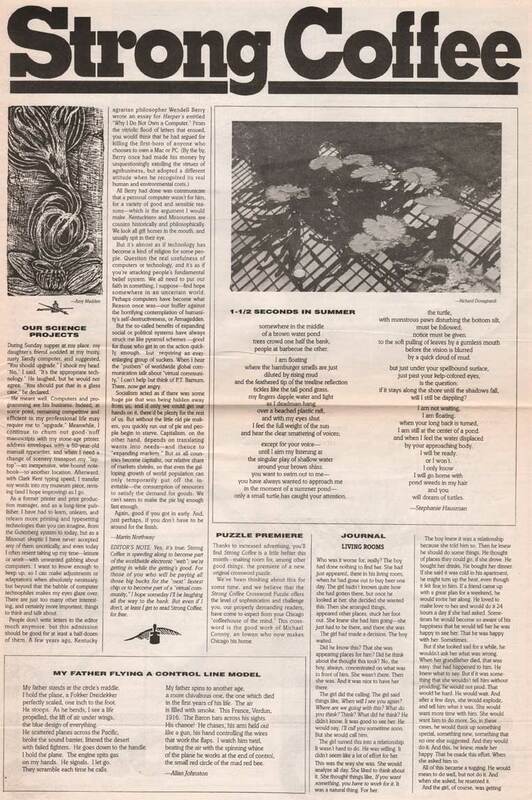 Our classified page, “Kiosk,” was the most interesting in the city, and for a while we ran a matchmaking personals column for café aficionados. As weekly sessions shifted from venue to venue at published intervals, we learned there is a price to pay in habituating edgy neighborhoods. One favorite was La Piazza, a European-inflected café with big picture windows at 3845 North Broadway. But early arrivals one week witnessed Chicago cops shoulder to shoulder kicking across a nearby lot seeking spent cartridges from a gunfight. Another week the gas station across the way was robbed. Our gallants began escorting female contributors to and from their cars. One busy night we heard a pop-pop outside and a young man stumbled through the doorway, collapsing at the cash register, shot through his fleshy upper leg. Officers arrived before the ambulance and one of them interviewed the victim as he intermittently regained consciousness. The cop ceremoniously flipped his notebook closed just as medics arrived, and almost as quickly we brew hounds voted to shift our weekly venue. We were still going, well, strong, as we passed our fifth anniversary without much fanfare, but for our sixth we held a reading party at the black-box Guild Complex at the Chopin Theatre, 1543 West Division. Our friend singer-songwriter Al Rose and his band sang his coffeehouse anthem “Cuptigo” and our audience applauded poetry and fiction read by star contributors, many of whom like poets Jacobus and Susanna Ruth Berger were experienced performers. Came Henry’s time in the spotlight, and my heart fluttered uncertainly as he paused on the stool, looked up into the light, and closed his eyes. After a long silence, the voice that emerged was not Henry’s but that of a black woman reciting the first-person “I Didn’t Know I Gave Birth to No Savior.” His triumphal performance persuaded more than any single event that Strong Coffee had “arrived” in some sense. But just as the unexpected comet Hale-Bopp had blazed brilliantly but briefly over Chicago during our publishing span, Strong Coffee did not last. A month after I retired from my duties as editor, Strong Coffee expired, in October 1997, our brew still fresh after seven years. No blame or regrets to share here, just good memories. But just as he had in each monthly issue, maybe my friend Tom Asch should have the last word here. “I’ve always said,” he told me over the phone, “if we’d had any idea what was involved, we never would have done it.” But more contemplatively he added that although producing our free-access print medium circulating through our coffeehouse community was more “time consuming” it was also “more satisfying than the Internet.” It was never easy, but it sure was fun.